The term daulat was introduced into Malay political tradition to give new meaning to the concept of andeka of the earlier Buddhist kings—”aword that meant the ghostly forces that lived around sovereign and smote with evil any reckless person who blasphemed their majesty” (Wilkinson 1932b: 80). Thus, daulat enunciates the religious aspect of politics which function to magnify the position of the rulers, that they have religious sanction to exercise their power. Daulat therefore cannot be sufficiently interpreted by such words as “sovereign” or “power”. It is the divine quality which is inherent in the rulers of the Malay world (Errington 1975: 118). As to a divine quality, the concept of daulat regards the rulers as having a sort of “divinely-endowed power or gift” which enabled them to exercise political power over the subjects (Khalid-Thaib 1981: 309). The magnification of rulers in the concept of daulat is supported by the fact that the term is used in conjunction with the royal Islamic title, “§ill Allāh fī al-‘ālam, “God’s Shadow on Earth”. Hikayat Raja-Raja Pasai provides us with a good illustration. The text relates that Malik al-Salih—the converted ruler who immediately assumed the title sultan—was bestowed with the famous epithet in the Muslim world, “God’s Shadow on Earth” (Hill 1960: 57-58) which was used together with daulat. The text states, “Daulat dirgahayu Shah Alam §ill Allāh fī al-‘ālam, O King, Lord of the Realm, God’s Shadow on Earth, may you live for ever” (Hill 1960: 58). Hence, daulat, together with honorific titles, clearly mark a claim to divine right by the rulers as their power is derived from God (Lewis 1998: 45-6).9 The adoption of these royal Islamic titles had a significant impact on the power establishment. These titles dignified the rulers with divine attributes, credited them as having religious legitimacy to rule the kingdoms, endowed them with many rights and privileges, and placed them above the subjects (Wahab 1983: 102). The rise of raja-oriented Islam was of course not a surprise. It contained the basic notion of the Sufi belief of the “perfect man” (insan kamil, Ar. al-insān al-kāmil), and hence made a contribution to the Islamization of the archipelago (Johns 1961: 143-60). 11 It was due in part to the flexible nature of Sufism that Islamization proceeded in the domain of the kingdoms. It was endorsed by the converted rulers and therefore—to quote Milner (1983: 30)—”occurred in the idiom of rajaship”. Islam appears to have been integrated since its inception into the existing system of politics that focused on the ruler. In accepting Islam, the rulers were by no means threatening the ideological bases of their kingdoms (Milner 1983: 45). Instead, it contributed to enhancing the political notion of omnipotent rulers. The idea of insan kamil therefore became one of the most celebrated Sufi thoughts in the early development of Islam in the archipelago. Theworks of the leading Sufi ‘ulama of Ibn ‘Arabi and al-Jili, to whom the Sufi concept of perfect man has been credited, were frequently referred to and therefore influential in the Islamic discourses in the early stage of Islamization in the archipelago.12 The idea of perfect man paralleled the raja-oriented notion of politics of the archipelago, both of which supported the idea of omnipotent rulers which then resulted in the formulation of a “Sufi king” (raja Sufi). Here, the rulers were depicted in Sufi terms and were believed to have “fully realized his essential oneness with Divine Being” (Milner 1983: 39). It was also this Sufi idea of insan kamil that constituted the substance of a poem by Hamzah Fansuri, a leading ‘ālim of the heterodox Sufism of wahdatul wujud (Ar. 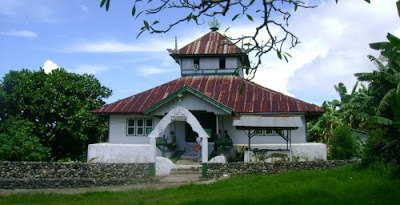 wada al-wujūd) in the Acehnese kingdom. In his capacity as shaikhul Islam of the kingdom, he projected the ruler of Aceh, Alauddin Ri‘ayat Shah (1588-1604)—his patron—as having reached the highest station of the Sufi path. He credited the ruler as being “wali”, “kamil”, and “kutub” (Ar. qulb), all of which indicate that one has reached the last stages of the spiritual experiences (Milner 1983: 41-2). Sufism was also taken to be the foundation for the construction of a kingdom royal palace. As Brakel (1975b: 60-1) showed, a garden within the royal palace that was built during the reign of Iskandar Thani, the socalled Taman Gairah, was designed with a specific arrangement to become the center of spiritual energy. Bustan us-Salatin by Nuruddin al-Raniri (Nūr al-Dīn al-Rānīrī) (Iskandar 1966: 48)—from which the information of Taman Gairah is sourced—mentions one site right in the middle of the garden, gunongan, which functioned as a sacred place where the Acehnese rulers meditated in order to gain the highest spiritual achievement, as the “Sufi king”. The Sufi idea of wahdatul wujud also served as the foundation for the political system of the Malay-modelled Islamic kingdom of Buton in Sulawesi (Yunus 1995). Nevertheless, it has to be stressed that the politics of the Sufi idea of the perfect man did not remain unchallenged. The call for shari‘ah (Ar. sharī‘a)-oriented Islam, which began echoing in the seventeenth century, had considerable impact. The Sufi thought of wahdatul wujud by Hamzah Fansuri (d. 1607) and Shamsuddin al-Sumatrani (Shams al-Dīn al-Sumatrānī d. 1630) began to be contested (Azra 1999a: 665-86), and al-Sumatrani’s chair in the office of shaikhul Islam was replaced by al-Raniri, the proponent of shari‘ah-oriented Sufism or neo-Sufism. As a result, raja-oriented political culture became increasingly Islamic. And this began to occur in the seventeenth century, alongside the growing network of the lands below the winds with the Middle East, in particular Mecca and Madina, as I will discuss as follows.